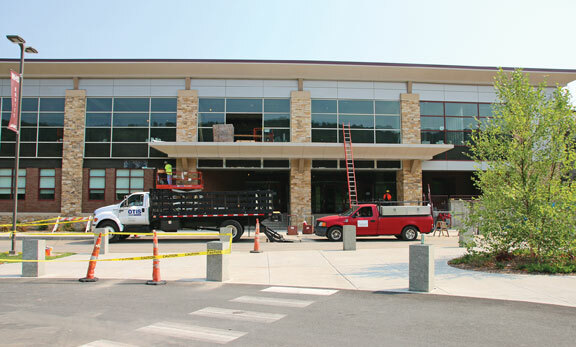 NAUGATUCK — As summer winds down, so too is the renovation work at Naugatuck High School. The $81 million renovate-to-new project at Naugatuck High School, which broke ground in April 2013, is expected to be finished in November. The construction manager for the project is Torrington-based O&G Industries. 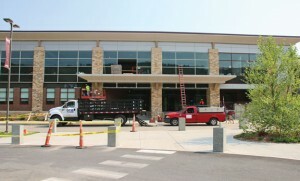 The majority of the work in the high school is slated to be complete by the time the new school year starts on Sept. 2. Saam said the work is currently focused on the cafeteria and what used to be called the Applied Education Wing, which is now known as the East Wing. “It still looks pretty much like a construction zone, but we still have two more weeks and O&G is pretty remarkable in what they can get done in two weeks,” Saam said. Saam said the teachers whose rooms have been under construction are anxiously waiting to be allowed to come back in and ensure their rooms are set. Once the renovations are finished inside the high school, work will then shift to the new Board of Education offices, which will be in a wing of the high school on Rubber Avenue. The district offices are currently in the Tuttle Building on Church Street. The Board of Education offices will have a separate entrance off of Rubber Avenue that will only access the board’s offices. “That will be solely the Board of Education access. Once you pull into that entrance you cannot get to the high school side,” Saam said. Saam said that design was intentional to keep traffic out of the bus loop at the high school. Burgess Robert Neth, who is the chairman of the Naugatuck High School Renovation Committee, is pleased with how the project is coming together. In addition to the new look inside the building, returning students will notice an emptier parking lot. “By the time school starts O&G will have taken their staging area and moved it over to what will be the Board of Education parking area. So we’ll get that parking lot back,” Saam said. Saam added the parking lot it will need to be paved before students can use it. She does not expect it to be ready for student use until the second quarter of the school year. The project has hit a snag when it comes to the woodwork in the auditorium. Saam said the plan calls for the woodwork to bow in two different directions and to be fire resistant. “The problem is you can’t bow fire-rated wood and you can’t not have fire-rated wood. So it’s been going back to the drawing board between the architects and the provider of the materials,” Saam said. Saam said the provider plans to present a suitable substitute that is able to bow and meet fire regulations. While she acknowledges it has been a setback, Saam said she is “cautiously optimistic” about the problem being fixed. Saam also took time to thank the custodial staff for all the effort they put in to keeping the school looking clean. Superintendent of Schools Sharon Locke said the district reduced the custodial staff at every school and may bring a recommendation to the board if it feels the need to add more staff. Neth said when the work is finished tours will be given of the newly-renovated school. He’s hopeful people will appreciate the work. “I just hope, when it’s complete, people come and appreciate the work that’s been done. People talk about the budget being too high, but this is something that will be here for the next 50 years. This is an investment for the future of the kids,” Neth said.